Pam, Owen, and I took a trip down to Mississippi this past weekend to go see my family. So we decided to grab a hatchet and an axe and go cut down the tree. We hacked and hacked, and made a little progress. But we were having fun, so we didn’t care. Then my dad walked out with his fancy shmancy chainsaw. He cut a wedge into one side of the tree, then the chain came off the chainsaw. We were gonna finish cutting down that tree with our axe and hatchet. He fixed the chainsaw, and the tree came down a minute or two later. Here’s the takeaway point for you in your studio. Sometimes you may not have the right tool for the job, but that doesn’t necessarily mean you shouldn’t give it a shot anyway. Sure, we could’ve used a chainsaw from the beginning, but we wouldn’t have had nearly as much fun. Sure, you may not be a great mix engineer right now. Sure, it might make sense to have someone else mix your song. Heck, they might do a better job AND do it much faster than you can. But just because it’s more efficient doesn’t mean it’s always the right thing. Sometimes you just need to have fun hacking away at a mix with your little hatchet. As long as you’re having a blast, that’s all that matters. 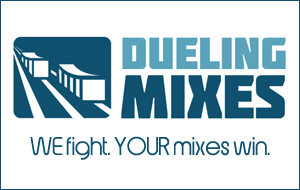 And that’s what we’re doing over at Dueling Mixes. March is right around the corner, and we’ll be giving away another set of killer tracks for you to “hack away” at in your studio.